Check out an excerpt from the first book of The Conjurors Series: The Society of Imaginary Friends. 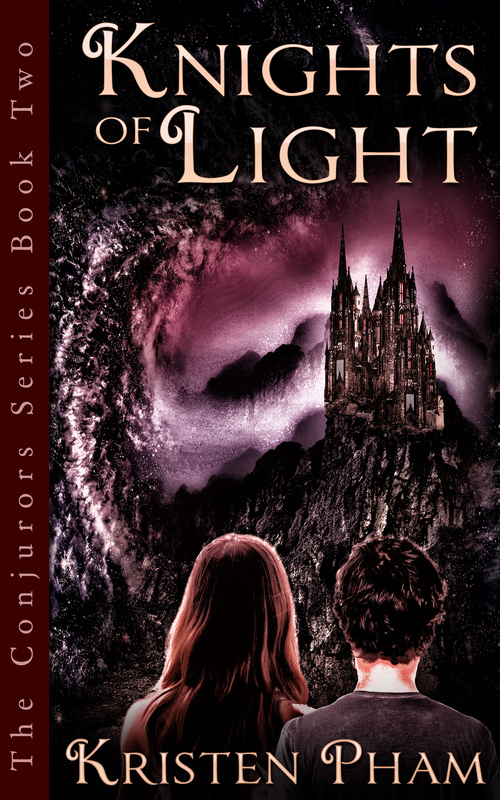 In Knights of Light, the fast-paced second novel of The Conjurors Series, Valerie searches for the father she thought was long dead and begins to come to grips with the immensity of her new power. Check out an excerpt from the second book in The Conjurors Series: Knights of Light. The battle is over. Now it’s war. Valerie’s entire life has been spent fighting for survival. But now, the stakes have never been higher, and her enemies have never been more powerful. The Fractus have proven that they won’t hesitate to kill those who stand in their way, including the people Valerie loves. And their path of destruction is growing—on Earth and the Globe. With Reaper always one step ahead, Valerie must find a way to change the game, or risk never catching up to an enemy with the conviction and power to upset the delicate balance that protects those without magic from being exploited. In the third novel of The Conjurors Series, Valerie has the life she’s always dreamed of—a family, a budding romance, and powerful magic that she is finally learning to harness. She also has an enemy determined to rip it all away from her. Valerie Diaz has a power that she can’t contain, and it’s killing her. Bounced between foster homes and the streets, she only has time to concentrate on staying alive. But a visit from the imaginary friend of her childhood opens a world of possibilities, including a new life half a universe away on a planet that is bursting with magic. 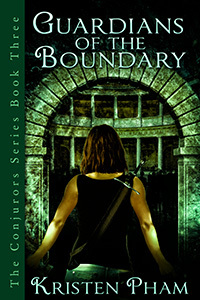 The first three books of The Conjurors Series follow Valerie on a journey that straddles two worlds. In order to survive, she must travel many light years away to a realm where anything is possible. But choosing to embrace her potential will set Valerie on a treacherous course – one filled with true love, adventure and perilous danger. 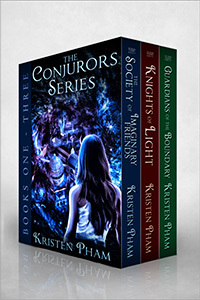 This collection includes the first three novels in this young adult fantasy series: The Society of Imaginary Friends, Knights of Light, and Guardians of the Boundary. Purchased individually, the ebooks would cost $10. The fourth and final book in the series, Edge of Pathos, is available on Amazon but not included in this collection. Click here to purchase this collection from Amazon. It was a flash of dark red hair that yanked Valerie out of her daydream and had her on her feet in seconds. Before the realization of what it meant reached her consciousness, she was already out the front door and halfway to the pickup truck. It was too late. Her ten-year-old foster brother had pulled the truck out of park, and it was sliding backward down the driveway. Sitting next to him, her blood-red hair ghoulish against her pale skin, was Sanguina. “Now put your foot on the pedal on the left,” Sanguina coached Daniel, flashing Valerie a knowing grin. Valerie’s peripheral vision registered a blue van barreling down the street right before she wrenched open the passenger-side door to the truck and jumped inside. Sanguina had already vanished. She hit the emergency brake a second before the truck reached the road, but not before hitting the mailbox at the end of the driveway. Valerie had no idea where Sanguina went, or where she ever came from, for that matter. She only knew that no matter how fast or how far she ran, Sanguina always eventually found her and tried to make her life hell. Last time, she’d found Valerie living beneath an overpass off the exit of a highway and had provoked a drug dealer into trying to shoot her. The time before that, she’d goaded a school bully into beating up a little freshman right in front of Valerie. That time, she hadn’t been fast enough to help him, and the boy wound up in a coma. Sanguina was Valerie’s very own personal tormentor, one she couldn’t run from, and what her doctors considered proof that Valerie was certifiably crazy. Because she couldn’t be real. “Uh oh,” Daniel’s voice suddenly sounded very young and scared. The front door swung open, and the biological son of the couple she and Daniel were living with stormed outside. Adam, twenty-one, only did three things, as far as Valerie could tell: work out relentlessly, steal from his mother’s purse, and take out his bottled-up aggression on the two foster kids living in his house—when his parents weren’t around. Adam’s eyes narrowed as he barreled toward his truck. He jerked the driver-side door open and grabbed her arm, throwing her to the pavement. She winced when her elbow and knee hit the concrete, but she refused to give him the satisfaction of making any sign that she was in pain. She knew his type, and seeing her scared was exactly the thrill he was looking for. While she was down, he kicked her in the gut. She jumped to her feet before he got a second shot in. Her first instinct was to fight back. He’d be in for a surprise, because she’d fought bigger, tougher men than this bully, but she stopped herself, remembering Mrs. Sims’ warning that morning. “I won’t tolerate any fighting now, hear? Not if you want to stay in my house,” she had said gruffly. Valerie had given her a small nod, keeping the polite smile she had been wearing for the past two weeks pasted on her face. This was the first time she’d had a real bed and three meals a day since she’d been in the hospital two years ago, and she didn’t want to mess things up. She’d just take a few hits from Adam and keep her mouth shut. “You’re dead,” he said. He had a look of grim satisfaction on his face. He’d probably explain her bruises to his parents as being the result of her careless accident. “It was a mistake. Take it easy,” she said, automatically slipping into a defensive pose, her arms a little raised in front of her, and her feet anchored firmly beneath her. Out of the corner of her eye, she saw Daniel sliding out of the truck, probably ready to come to her defense. He was a sweet kid, and the idea of him getting in the middle of this terrified her more than anything else. She tried to subtly nod her head to the side, indicating that he should run, but Adam saw her movement and turned. “He’s not a part of this. It’s my fault,” she said. But she’d never been a good liar—probably a big part of the reason why she hadn’t lasted long on the streets. “It was him who drove my truck, wasn’t it?” Adam said, turning his rage on Daniel. Daniel’s face was white, but he stood his ground. Valerie protectively stepped in front of him, but Adam shoved her aside. Whenever she found herself in these situations, instinct always took over. Valerie had learned not to think and to just let her movements flow naturally. She felt as if she was watching from a place deep inside of herself as Adam’s fist came hurtling through the air toward Daniel’s head. Valerie caught Adam’s arm mid-punch, stopping it before it reached its target. Surprise registered on his face before she followed up with a blow aimed at his chest. Her fist connected, and he was thrown back so violently that it looked like he’d been hit by an invisible bus. He crashed into the side of the truck. “How did you do that?” Daniel whispered. Adam groaned and looked up at her, a little stunned. Valerie herself had no idea where her strength came from, but she assumed that it was adrenaline, like mothers who lifted cars when their children were trapped beneath. She grabbed Daniel’s hand and pulled him toward the house. Once inside, she locked the doors and even checked that the windows were latched shut. Adam would be coming after them, and he’d be mad. She had to stall him until Mrs. Sims made it home. As always, her strength evaporated rapidly now that the immediate threat was gone. She leaned against the wall for support, but felt herself sliding down toward the floor. Expending all that energy took a toll, and Valerie knew it would be at least a week before she felt normal again. “I’m fine,” she replied, managing a small smile. Valerie had trouble focusing on his words. She was always weak after a fight, but this was more than physical exhaustion. She was being pulled into a tidal pool of blackness. This, too, was a feeling she was familiar with, and she fought the tug with every ounce of her strength. She knew that in the darkness, sucking at her consciousness, were terrors greater than anything she experienced awake. But her struggle was useless. Her knees finally gave way, and she fell forward, crashing into the ground. The last thing she remembered was the cool floor against her cheek before the darkness wrenched her under. Part of Valerie knew that she was unconscious, and that her body was somewhere on the bathroom floor. But the scene before her eyes was so real that it was hard to remember this couldn’t be anything more than a terrible nightmare. She was in a strange bedroom, kneeling on a small wooden bed, clutching her sheets with sweaty hands. Her heart beat fast and adrenaline chased through her veins, amplifying her eyesight and hearing. In the corner of the room, the shadows began to move. Out of the darkness, Sanguina crept toward her. She was gaunt, and in the silvery light, Valerie could make out a network of purplish-blue veins throbbing beneath her translucent skin. Her eyes were a bottomless well of darkness, filled with cold hate. Sanguina was much more terrifying in this shadow world than she was in reality. Valerie wondered how her tormentor traveled so fast, one minute in the pickup truck and the next in this strange bedroom. It was as if she wasn’t content torturing Valerie when she was awake; she had to visit her nightmares as well. No matter how many times Valerie saw her, or how often she told herself when she awoke that Sanguina was only a figment of her imagination, she was always frozen by the fear inside her. “She’s not real. This is a dream. She can’t hurt me,” Valerie chanted softly, trying to convince herself that her words were true. “Give it to me. You know what will happen if you don’t,” Sanguina said in a low, toneless voice that made Valerie’s skin crawl. “Or maybe you want me to visit your family again?” a deep voice growled nearby. She realized that a tall, lanky man with yellow eyes was watching her as well. It wasn’t the first time she had seen him, but she didn’t know his name. They didn’t always appear together, but when they did, it meant they wanted something. Something Valerie knew she shouldn’t give them. But she always gave in—anything so long as they’d leave her alone. She wondered why she was always so much more afraid, so much weaker, facing these two in a dream than she was in real life. “Please, go away,” Valerie begged. “We’re never leaving. Get used to it,” Sanguina rasped in her ear, suddenly so close that Valerie was looking directly into her black eyes. It was like staring into a void. A scream built in her lungs, and she squeezed her eyes shut to escape the emptiness of those eyes. Some time later, Valerie peeked through her lashes. Her heart was ricocheting around in her rib cage, and she could still taste the echoes of her last scream. Sanguina’s hollow eyes were gone, and instead she saw the little window next to her cot in the room she shared with Daniel. She opened her eyes wider and saw a familiar, beloved face close to her own. This was another one of her hallucinations, like Sanguina or Yellow-Eyes, except that this one comforted her. But Cyrus only glowed for a second and then faded away. She blinked, but he didn’t reappear. Fully awake now, she realized that she was kneeling on her bed, clutching her sheets in her hands as she had been during her unconscious vision with Sanguina. She was so weak, completely drained—physically and emotionally—by what she had experienced. It was a different kind of fatigue than what she experienced after the fight. Then, she had been exhausted, but she would have been able to make it through the day. Now she wondered if the next time she closed her eyes she might not be able to open them again. She let herself collapse back on her bed. The leftover fear from her dream receded, but it was replaced by a gnawing anxiety about what had happened to her and how she had gotten here. She saw her reflection in the bedside mirror and groaned. Her waist-length brown hair was a sweaty, tangled mess, and her usually warm brown skin had a yellow tinge. The door cracked open, and Daniel peeked in. He thrust a peanut butter and jelly sandwich into her hand. His face vanished, and a minute later, Mrs. Sims came through the door. She was a tall, imposing woman who rarely smiled. Valerie suspected that housing foster children was simply a way to make some extra money, because she clearly didn’t like children. Still, she wasn’t a bully, like her son, so Valerie couldn’t complain. Even considering Adam, this house wasn’t close to the worst of the places she’d lived. She hoped she’d be able to stay. “Adam told me you wrecked his truck,” Mrs. Sims said accusingly. She stood over Valerie with her arms crossed. “Daniel wasn’t involved —” Valerie started to say, but Mrs. Sims cut her off with a shake of her head. Valerie nodded, and Mrs. Sims left. Maybe it was for the best that Daniel was leaving, too. Without her to protect him, Adam could really do some damage. She hoped that he would go to a nice couple with no kids. Or better yet, maybe he would be adopted. It was better to think that way, since there’d be no way to ever see him again. Still, anxiety for her future made her stomach hurt, and forcing down the sandwich made her want to choke. What if her next foster family was like the one she’d had two years ago, and they locked her up in a closet? Or it could be another situation where she had to lie awake at night, guarding herself against any midnight attacks from other foster kids in the house. She’d have to go back to the streets again, which she hated. Her breathing became shallow, as if she were breathing through a tiny straw. Her heart pounded so hard in her chest that she thought it would explode. She didn’t normally give in to her fears like this, but she was already so weak. Daniel tiptoed into the room and saw her gasping for air. “Mrs. Sims! Help! Valerie’s dying!” he cried. Then she collapsed on her pillow, back into sweet unconsciousness. The dreams were never exactly the same, but they usually began with Sanguina’s terrified eyes, life draining out of them the moment before Valerie saved her. Then the ecstatic burst of power that she released in a torrent she could barely control. Finally, a sinking into darkness. The most frightening part was the emptiness inside her that was in stark contrast to the connection she had felt with all of life seconds before, when she had channeled her magic to save her enemy’s life. It was a familiar, abandoned loneliness that she had run from her entire life. The next part of the dream was different every time. She had a choice—give in to the blackness or fight against it. Sometimes she let herself dissolve into the darkness until there was nothing left of her, and with that came a kind of peace, finality. Other times, she struggled back toward light and life. This choice required monumental effort, but it also led to the knowledge that she wasn’t really alone anymore. Always, no matter what she chose, she knew that she had traded something incalculably precious for Sanguina’s life, but she didn’t know what it was—some of her magic, years of her life, a piece of her soul? Then came the pain, emotional and physical agonies that mirrored each other. Even though she knew it was coming, she couldn’t stop herself from moaning. “Come back, it’s okay, you’re safe now,” Thai’s voice pulled her from the dream. Every time the nightmare had swept her away over the past four months, he was there, pushing her sweaty hair back from her forehead. His eyes were deep brown pools of sympathy. Whatever she had given up, it was worth it for that moment. “Feels a lot like paradise,” Valerie said, skimming her hand through the cool sand on the beach in Half Moon Bay, California. The chill in the air stung her cheeks, and she tipped her head back to soak in some of the warm April sunshine. “Agreed,” Thai replied, and he gave her the little half smile that made her feel like they shared a secret. Even though for the past four months, Valerie and her twin brother, Henry, had technically been hiding from the evil Fractus, they were the best months of her life. They had been camping with their close friend, Thai, at a remote site, spending their days walking the beaches, learning about their powers, and plotting their next move to travel from Earth to the Globe, a world filled with magic. “I’d like to stay here forever,” she admitted. She shrugged. “I feel fine.” She was better than fine. She was happier than she’d ever been, which left her questioning if she really wanted to return to the Globe, a world that had been created in the center of a black hole for magical beings called Conjurors. A world she’d had to try to explain to her newfound twin. A world he, too, would soon have to call home. She had tried to explain to Henry what her friend Cyrus had explained to her. Many centuries ago, magic had existed on Earth, but some chose to abuse their powers and enslave humans who didn’t have the gift. In order to protect those without powers, the rest of the Conjurors—the good ones—created the Globe and forced everyone with magic to leave Earth. Rules were put in place to prevent anyone born with magic in the future from using their powers. The problem was, every now and then, someone—like Valerie—was born with too much magic. On Earth, that could make you very sick, and ultimately you could die. Such people had to be transported to the Globe where they could use their magic freely and live a full life. That was what had happened to Valerie six months ago. She’d traveled through a portal to the Globe, which was separated from Earth with a barrier so that no one with magic could ever return. But Valerie somehow broke that rule when she came back to Earth to save her brother’s life. Thai threw a rock into the surf. She couldn’t stop sneaking peeks at his golden tan and deep brown eyes. He was the best-looking guy she’d ever seen. Even better, he could make her laugh till she could barely breathe, and he was the first person in her memory who had taken care of her. It wasn’t up to her to always be on guard for danger, because she had a partner who would help shoulder the burden. As he leaned in to brush some sand off of her cheek with his thumb, she became a little breathless. She wondered if the thrilling energy that zinged through her every time they accidentally touched affected him as well. Suddenly, the sound of a loud motor interrupted her thoughts. They looked toward the ocean in surprise as a girl with long, blonde hair zoomed through the choppy waves a hundred yards out on a jet ski. “It’s early in the year for that. It’s too wavy out there, and the water’s freezing, even with a wet suit,” Thai said. The words were barely out of his mouth when the engine abruptly cut out. They watched with horror as the girl was smacked from the jet ski by a huge wave. Within seconds, he was expertly diving under the waves toward the girl, and she picked up his cell and called 911. After she made the call, a boy with dark hair streaked with silver came running toward her—Henry. “I could feel that something was wrong,” he said. Valerie and Henry had always had an intense mental connection, even before they had met in person. Now that they had grown to be close as brother and sister, their bond was even stronger. As hard as they tried not to use their psychic link, since using magic on Earth made them both sick, sometimes it was impossible to stop the connection. She quickly explained what happened, scanning the ocean the entire time for Thai. At first, she couldn’t spot him. “He could die out there,” she said, a vision of him being sucked out by one of the notorious rip tides along this stretch of beach making her heart pound. “He’s gonna be okay,” her brother insisted, but he was chewing his thumbnail down to a nub. She strained her eyes down the beach and was flooded with relief when she saw Thai bent over the girl, giving her CPR. By the time she and Henry reached them, the girl was coughing up a lungful of water. “Welcome back,” Thai said, patting the girl gently on her slender back. “Thank you,” she said, turning to him with big blue eyes brimming with tears. She looked like she was around Thai’s age, eighteen, and Valerie could see that even with tears streaking her face and her hair plastered against her forehead, she was strikingly beautiful. Loud sirens screeched from the top of the cliff, and two paramedics hurried down the stairs. They reached the group and began assessing Logan for injuries. She appeared to be okay, but they put her on a stretcher to take her to the hospital anyway. “We’ll come with you,” Thai said, but Logan shook her head. She fluttered her eyelashes at Thai, and Valerie was dangerously close to rolling her eyes. Logan was laying on the damsel-in-distress act pretty thick. She looked over at Thai, to see if he was buying it, and she saw with relief that there was a spark of humor in his eyes. “Do you think it was safe to tell her where we’re camping?” Henry asked as they made their way back to their campsite. “Let’s not overreact. Don’t turn back into Mr. Paranoid on me again,” Valerie said with a grin. “The last time I was paranoid, it turned out to be a Fractus henchman trying to kill us all with frog poison!” Thai exclaimed. “I’m never gonna live that down, am I?” she said, trying to lighten the mood, so that Henry didn’t start reliving the horrific kidnapping that had almost killed him. “It’s only a matter of time before the Fractus find us here. Chisisi can’t get us out of here soon enough,” Thai said. They hadn’t seen Chisisi, who helped protect them on Earth, since he had watched over them at the Mena House Hotel in Egypt where they had stayed before she had used the portal at the Great Pyramid to travel to the Globe. Without his help, she never would have made it there. “He’s right, Val,” Henry agreed, and a wave of worry washed from his mind to hers. “How would they ever find us? No one other than Henry’s dad and a handful of Conjurors on the Globe who look out for us knows where we are,” Valerie reasoned. But despite the fact that only a trusted few knew of their location, an uneasy tingle in the back of her mind warned her that the Fractus were coming. They had tormented Henry for years, and surely finding him again was a top priority. Valerie squinted toward the tents where they were camping and saw that her best friends on the Globe, Kanti and Cyrus, were waiting for them. She, Henry, and Thai began to jog toward their camp, and she noticed that Henry was smiling widely. Valerie got there first and wished she could give her friends a hug, but they were mentally projecting themselves to Earth from the Globe, so she had to settle for giving them both their signature “air high-fives” that they had invented as an alternative as long as they were half a universe apart. Although they were projecting, their magical powers allowed them to see and hear everything that was happening on Earth. Once everyone was gathered around the tents, Henry, Thai, Kanti, and Cyrus burst into a loud, off-key rendition of the “Happy Birthday” song. Henry looked at Valerie’s shocked face and threw back his head to laugh. This made Valerie start giggling, too, half with surprise and half at the rare sound of her brother’s joy. She looked around, and for the first time, noticed a cake, presents, and even a few balloons set up next to the tents. “You did all this?” Valerie gasped, clutching her brother in a tight hug. “Naturally, he had help from the best. We have a lot of birthdays to make up for,” Cyrus said. He knew how lonely her childhood in the foster care system had been, because he had been her imaginary friend for many years. Looking around at all of her friends’ happy, expectant faces, a rush of happiness that she had never known almost overwhelmed her. It was the first birthday party she had ever had, and it was perfect. “I’ll forgive you if you let me have the first piece of cake,” he said with a grin. “Don’t forget the music for those of us who can’t stuff our faces,” chimed in Kanti, and Thai pulled out a battery-powered radio and turned it on. The heavy beat of a Drake song had Kanti busting out some of her legendary dance moves. She was incredibly graceful when she danced, and it was easy to forget that she looked like an evil witch in a fairy tale, warts and all. Henry laughed and tried to imitate her, but it was quickly clear that he had no rhythm. Cyrus joined in next, and he was even worse. Valerie was doubled over with laughter as Thai grabbed her hand and pulled her into the circle, and soon she was demonstrating her version of the moonwalk. “Not bad!” Thai said, and then showed off with a windmill, where he got into a kind of handstand, bending his arms at the elbows and whirling his legs around in the air… like a windmill. After that, even Kanti’s mouth was hanging open. “Can I cut in?” A low, threatening voice from Valerie’s nightmares wiped the smile off her face. She whirled around to see the squinty yellow eyes of Zunya glaring at her with smug triumph. And if Zunya was projecting from the Globe, his henchmen on Earth couldn’t be far. As if on cue, Venu’s hulking form stepped out from behind her tent. “Henry, Thai, step back,” Valerie commanded. “Not on your life. We do this together,” Thai said, but unexpectedly his face contorted and his eyes turned a soft gold. His younger alter ego, Tan, had taken over his body. Thai was an amoebiate, which meant that he was splitting into two people, making an exact copy of his genes, like an amoeba. “I’m gonna kill you,” Tan cried, stepping toward Venu. “How did you survive dropping off the edge of Victoria Falls?” Valerie asked Venu, shifting so that she stood a little in front of Tan, where she could protect him. 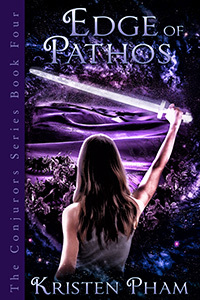 She wished that she had her sword, Pathos, with her. But it was back on the Globe, and without her magic, she wasn’t sure how effective she would be with it anyway. “Yeah, it’s a scare tactic,” Kanti said. She was kneeling next to Henry, who was breathing shallowly, his eyes dilated with fear. He had been terrorized for years by Zunya and Sanguina, who had manipulated his fear to force him to use his magic to give the Fractus new powers. Seeing one of his tormentors again was almost sending him into a panic attack. “You’ve made your point. Now get out of here,” Valerie said with as much command as she could muster. She knew that Zunya fed on fear, and the more anxiety she showed, the longer he would stay. “Be a good little puppy and run back to Sanguina,” Cyrus said, immediately understanding Valerie’s tactic. “She sure looked like she was calling the shots on the Globe,” Valerie taunted with more confidence than she felt. Tan lunged at Venu, who released a croaking rumble of laughter as Tan’s fist went right through the air where he stood. It was lucky that Venu wasn’t there for real, because his hands and feet had poison in them that could kill a grown person with a single touch. “Still mad about how easily I crushed you at the falls? I’ll do it again if you ever cross my path on the Globe,” Venu sneered, and Tan shook with anger. Valerie thought she was going to have to restrain Tan when, to her relief, he shuddered and blinked, and Thai was back in control. “We’re wasting time,” Zunya said to Venu. “Reaper will want to know where they are immediately.” Then he turned to Valerie, stepping so close that she could see the flecks of black in his yellow eyes. Her stomach churned with the old fear that always hit her at the sight of those eyes, but she refused to let him see anything but contempt on her face. Then Zunya and Venu vanished.